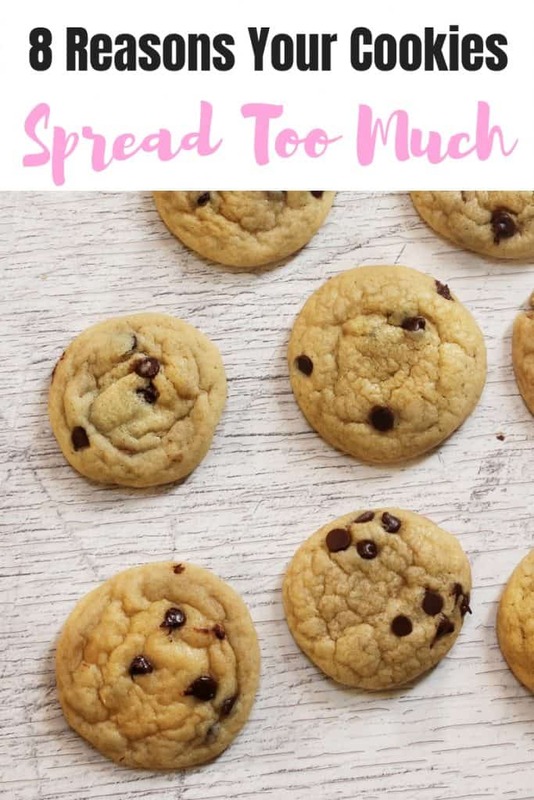 8 Reasons Your Cookies Spread Too Much- if you have asked yourself the questions “why are my cookies flat” and can’t figure out why then this is a MUST read! So as a kid I didn’t realize yet what a nerd I was. And as I got older not just a nerd but a baking nerd. Like I love reading about why my cookies failed and the chemical reactions happening in my cakes. Hi, my name is Heather and I’m a baking nerd. Do they have support groups for people like me? Oh right it’s called blogging. Now as a kid, I remember thinking how weird it was that one recipe (good old Nestle Tollhouse) could provide such inconsistent results. I mean it was the saaaaaaame recipe. What gives?! 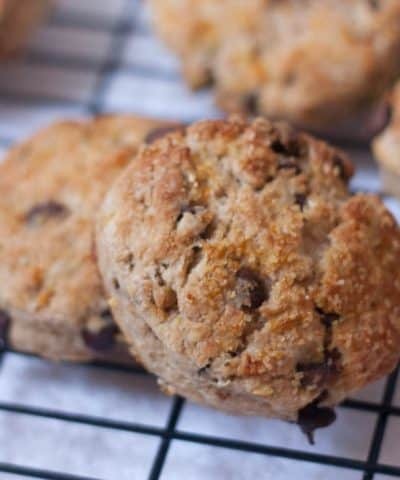 It’s all in knowing the science of cookies and following some simple baking rules. Here is what I want in a cookie- crispy chewy edges that give way to a soft almost some might argue underbaked molten chocolate chip center. No more. No less. Basically perfect cookies. Now, if you want big crispy flat cookies, then ignore my advice in this post. 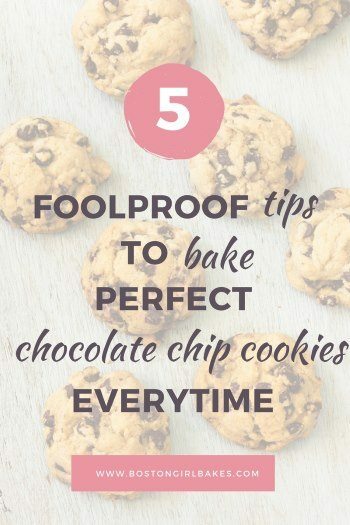 However, if it’s NOT what you were going for, then I have some quick tips for you to be sure to pay attention to the next time you are whipping up a batch of warm chocolate chip cookies (or any cookie for that matter). Before we begin, I need to stress the importance of investing in some quality cookie sheets. Sorry Dollar Store you ain’t going to cut it this time. You want heavy duty cookie sheets that are going to heat evenly. Here are my favorite cookie sheets- Chicago Metallic Traditional Uncoated Pan and Nordic Ware Aluminum Half Sheet – I also prefer light colored aluminum cookie sheets as opposed to dark colored cookie sheets because I find the dark ones heat too quickly. These are my 8 reasons why you have flat cookies that spread into a big old cookie puddle (and of course followed up with the “what you should do” to help fix the problem so you end up with perfect cookies every time). Because that’s why you are still reading, amiright? Reason #1 For Why Your Flat Cookies: You didn’t start with room temperature ingredients. Ugh. I know the cookie craving hits. You want cookies now. NOW. So you go ahead and pull out your butter, eggs, and everything else. 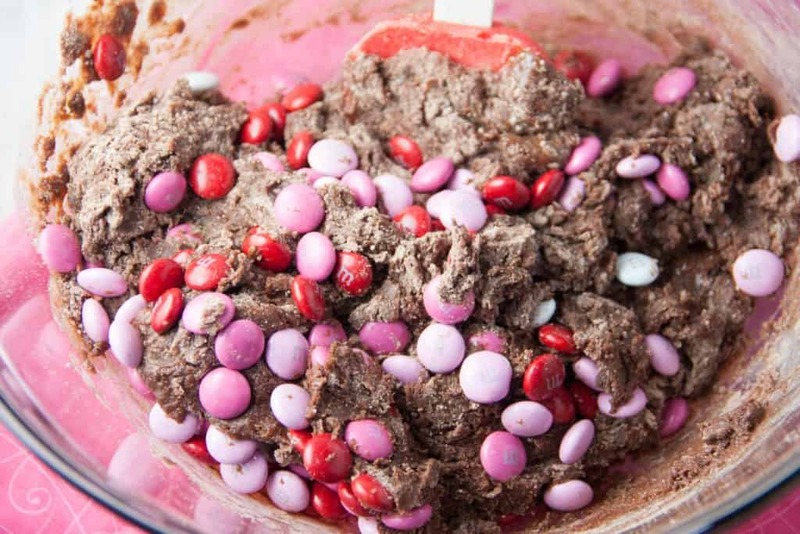 Grab your mixing bowl and spatula. Good to go right? Wrong. So wrong, friends. 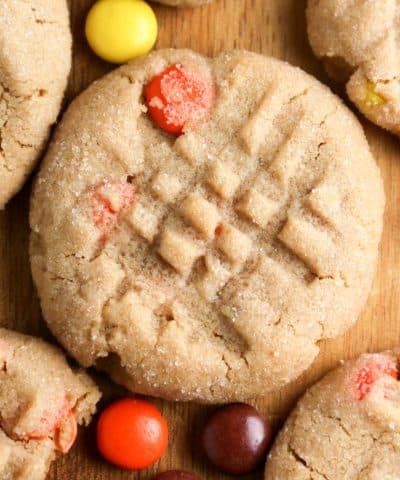 To get those perfect cookies every time you want room temperature ingredients. Do NOT ignore this step. Great question. Let’s talk science for a second. When you cream the butter and eggs together you are trapping air inside that cookie dough. That air is a crucial unspoken ingredient in your cookie recipe. 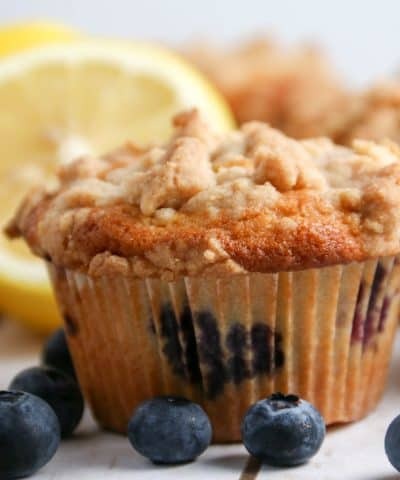 Trapped air = light, airy baked treats. Cold butter and eggs means less air is trapped and will result in dense, flat cookies. No good, folks. Can I use melted butter? Sure if you want those flatter crispier cookies. Go for it. I’ve done it. 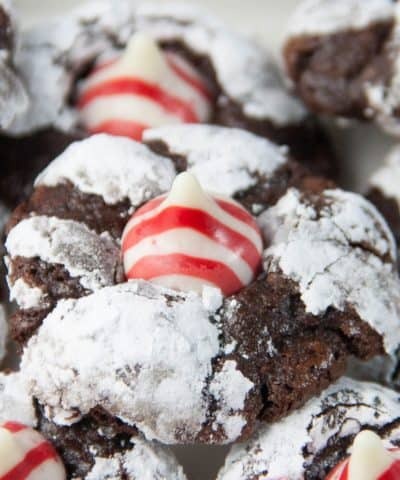 One of my favorite cookie recipes uses melted butter. But again if you do not want crispy thin cookies, then use softened butter. Melted butter will not allow for all that trapped air that will expand in your oven. If you want to read my full post on how butter temperature affects cookies – check that out here! So what to do if you are on short on time? Baking hack #1: Cut your butter into your cubes. By cutting your butter into small chunks, you increase the surface area decreasing the time it takes to soften that butter. Cut your butter into small chunks and then wait about 30 minutes or so. You can also try grating your butter with cheese grater. I also used to soften my butter in the microwave (a little trick I picked when working at a bakery)- just be careful. 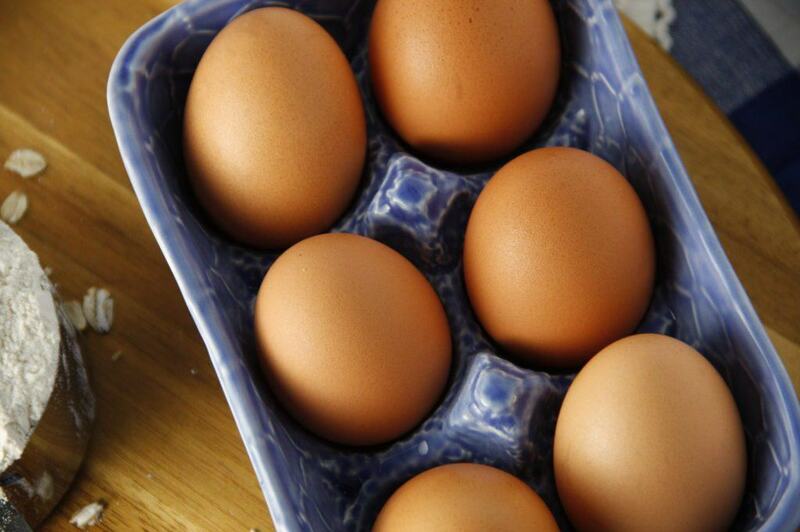 Baking hack #2: Place your eggs in warm water and wait 10 minutes. This will bring your eggs to room temperature in no time. Do NOT use hot water to soften your eggs. You don’t want cooked eggs! Just room temperature. Reason #2 For Why Your Cookies Are Flat: You didn’t measure your ingredients correctly. 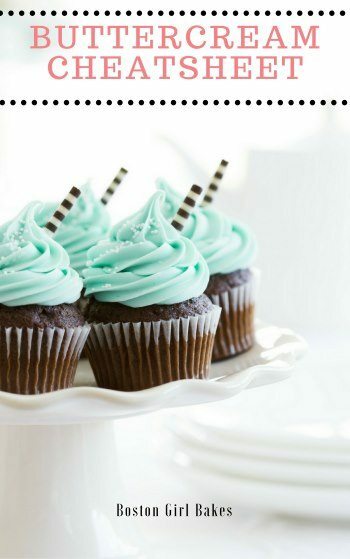 Measuring is KING when it comes to baking. Or should it be QUEEN? Well, either way- it’s extremely important. So important I wrote a big old nerdy long post on why measuring is important and how to measure ingredients when it comes to baking. One key ingredient I always aim to measure correctly is my flour. Too much flour and you will get cakey cookies. Not enough and it may not have enough structure to hold up in the oven, aka flat crispy cookies. 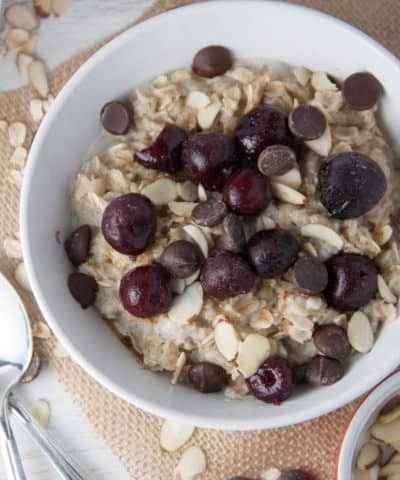 Dip a spoon into your flour and fill your measuring cup a spoonful at a time. Do not pack the flour down. Do not tap the sides of your cup. Just keep spooning the flour into your cup until it’s heaping at the top. Then with a knife or metal spatula run it across the top of the cup to level it off. What about those eggs? Be sure they are large eggs. Using the wrong size egg could also add extra liquid which may result in too much spreading as well. Baking is a science. So measure accurately to ensure your cookies come out 100% awesome. Every. Dang. Time. Reason #3 Why Your Cookies Are Flat: You didn’t pre-heat your oven properly. Ugh, it’s that whole patience in the kitchen thing. Not my virtue either. I hear you. But throwing cookies in a cold oven, or one that is not up to the proper temperature can drastically affect your cookies in the end. Now if you were baking a casserole or something, this step may not matter as much. Just keep that dish in the oven a tad longer. Easy peasy. However, baked goods are a whole other matter. So pre-heat your oven as your first step when baking. Let your oven pre-heat while you prepare your cookie dough. 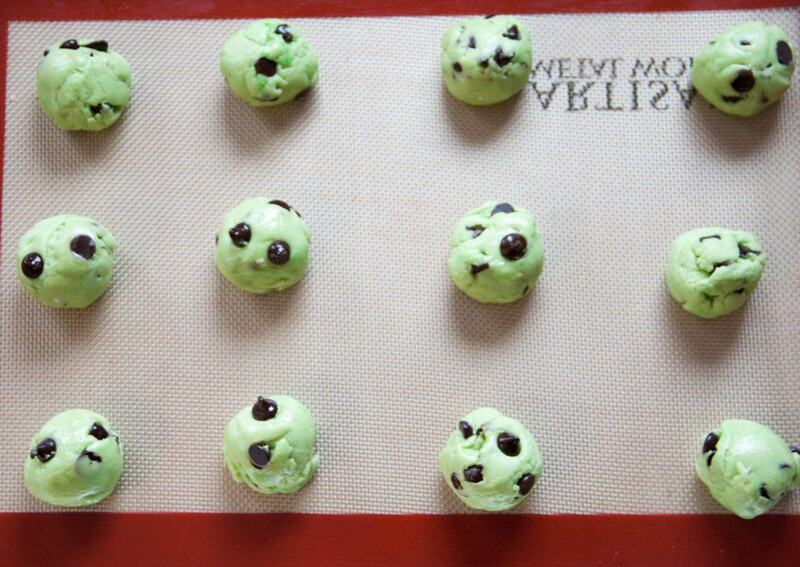 If your cookie dough needs to be chilled, then hold off and wait until your dough is ready. We will discuss this step later. But whatever you do, be sure you are not putting your cookies in an oven that is not at the specified recipe’s temperature. Just like a cold oven can affect your cookies, so can an oven that is too hot. 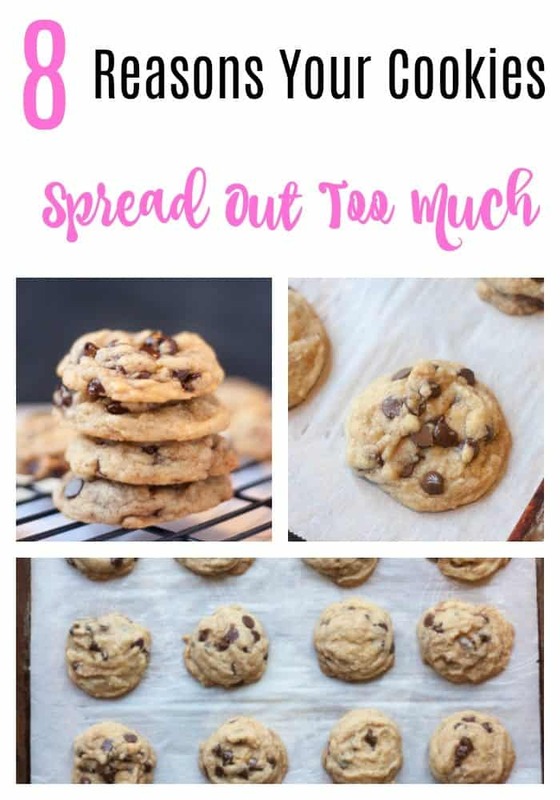 Too hot and that butter in your dough can melt too quickly causing the cookies to spread too much before your flour mixture has a chance to harden. So be sure your oven temperature is correct. Always preheat. Are your cookies still spreading? Then it’s time to…. Double check your oven temperature is correct. Now what if your oven doesn’t tell you when it’s ready? Buy an oven thermometer. So cheap. So easy. No more guessing games. Even if your oven does inform you by beeping incessantly to let you know it’s ready, I still highly recommend an oven thermometer. An oven thermometer is the only way to be accurate that when your oven says its 350 degrees its actually at 350 degrees. This way if your oven runs hot or cold you can adjust the temperature accordingly. 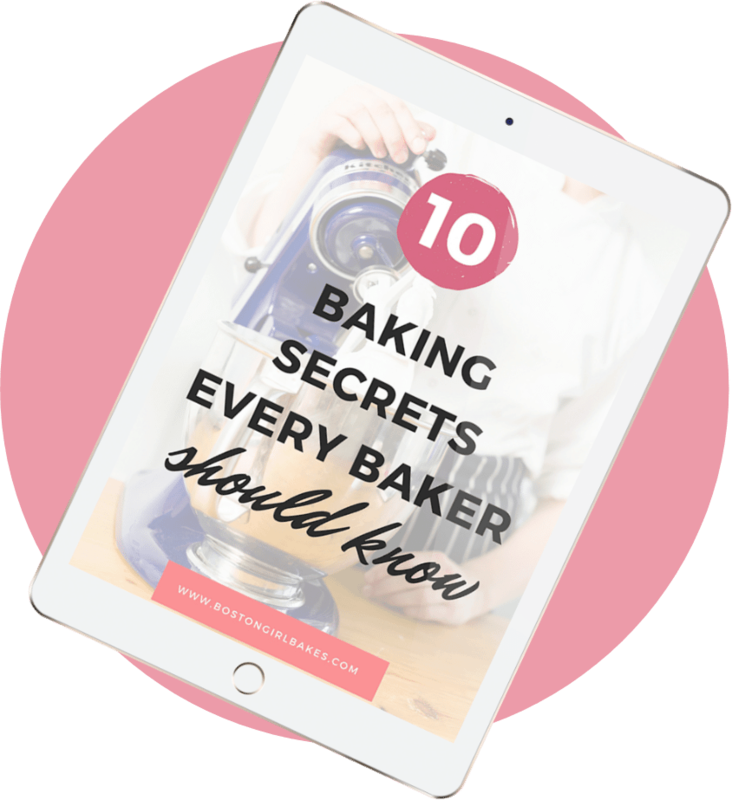 For more Oven 101, read this post! Reason #4 Why Your Cookies Are Flat: Your baking powder and baking soda are old. So if you don’t bake all the time like oh me for instance. I got problems. I know. Moving on. And when you go to bake cookies and go digging out your baking powder and baking soda from the back of the cupboard and dust off the tops of your baking powder and soda, then they may be too old to use. 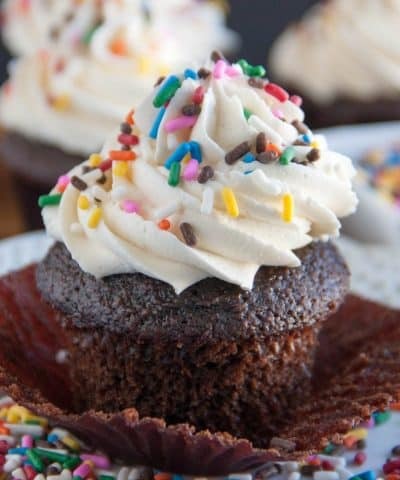 Baking powder and baking soda are what we call leavening agents. They help make your baked goods rise. If they are too old, they may have become inactive. Inactive = they won’t do squat for your cookies! 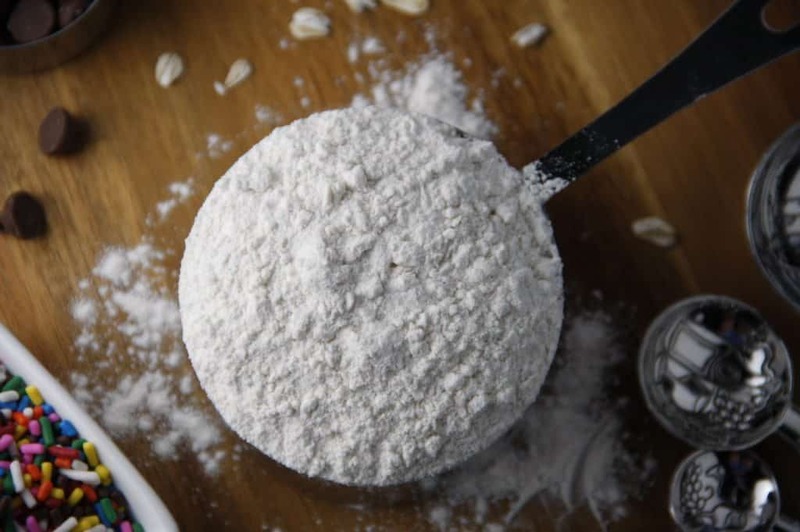 How To Check If Your Baking Soda and Powder Are Still Active? To Check Your Baking Soda: Measure out a 1/2 cup of hot tap water. Add 1/4 teaspoon of vinegar (baking soda needs an acid to react with). Add 1/4 teaspoon of baking soda. It should bubble up violently immediately. If not, throw it out. To Check Your Baking Powder: Measure out a 1/2 cup of hot tap water. Add in a 1/2 teaspoon of baking powder. It should bubble immediately. If not, throw it out. Reason #5 Why Your Cookies Are Flat: You didn’t chill the dough. Maybe this should be reason #1. I truly believe the best cookie it has to have the dough chilled first. A colder dough = less spreading. This is one of the things I learned in the Ultimate Cookie Handbook. You can learn all about how little changes to your cookies can make big changes to the end results. Tessa explains and shows this ALL to you. By chilling the dough, it solidifies the fat in the cookie dough. And the longer the fat stays a solid in your hot oven, the less spreading your cookies will do. I like to chill my dough for 24 hours. When you mix up your cookie dough, simply scoop your cookie dough onto a cookie sheet and then chill for 24 hours. I can’t stress enough scooping then chilling. I’ve tried it the other way around. And now unless you are The Hulk, or are in need of a ridiculous arm workout then remember to SCOOP THEN CHILL. Reason #6 Why Your Cookies Are Flat: You didn’t prepare the pans properly. Are you sensing a theme here for the perfect chocolate chip cookies? Preparation is key. f you bake up a second batch, be sure to allow the cookie sheet to cool off completely before putting more cookie dough on them. Heat is your #1 enemy here. Reason #7 Why Your Cookies Are Flat: You didn’t bake your cookies on the middle rack. This one is simple. Bake your cookies on the middle rack of your oven. You want even heat on top and bottom for them to spread evenly. That’s it. Middle rack. Done. Tess will show you what happens when you bake your cookies on different racks if you’re curious in her Ultimate Cookie Handbook! Reason #8 Why Your Cookies Are Flat: You didn’t cool your cookies properly. You left them on the cookie sheet too long. I allow my cookies to cool for 3 to 5 minutes. No more. No less. Any less and you risk them falling apart on you when you try to move them. 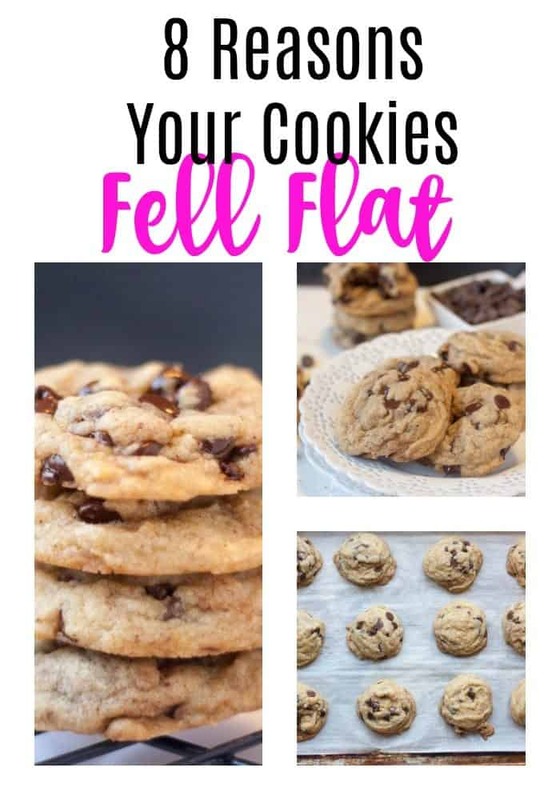 Any longer and the residual heat from the cookie sheet could continue to bake your cookies resulting in extra spreading and over baked bottoms. 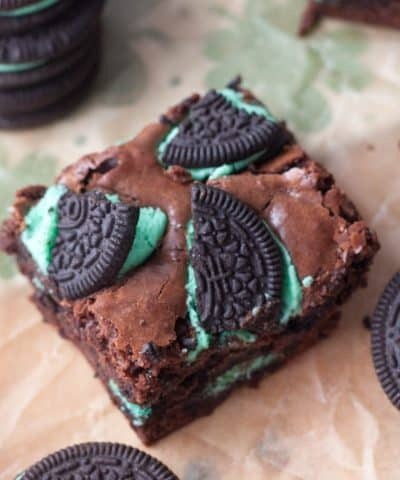 Place them on a cookie cooling rack, do no stack them up, and allow them to cool properly. What if your cookies still spread in the oven?!? Eat them anyway. I mean ok, maybe they won’t win any beauty contests. And maybe they don’t have the exact texture you were going for, but I find that if the dough was tasty the cookies will be too. 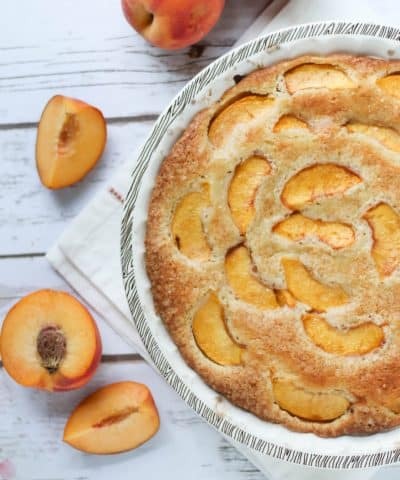 Crumble them and make them into a whole new dessert. Like this chocolate chip cookie trifle. Layer those cookie crumbles with some pudding. No one will be the wiser. 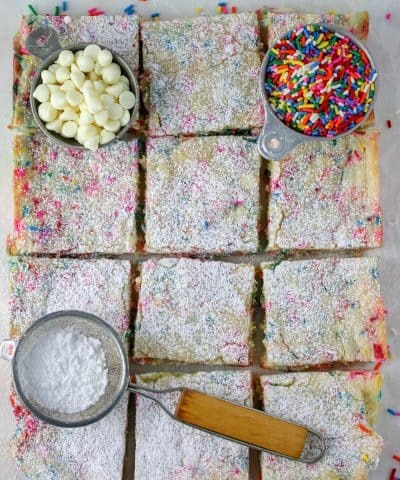 Layer them into an icebox cake. Flat crispy cookies are ideal for an icebox cake. No one has to know you were going for perfect chocolate chip cookies and ended up with big old cookie puddles. 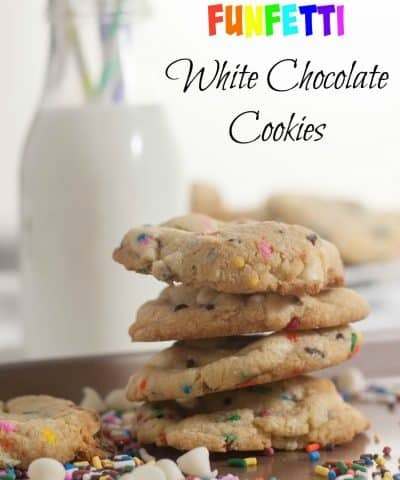 Learn everything you wanted to learn about how to make perfect chocolate chip cookies with The Ultimate Cookie Handbook. I am an affiliate for this book, so I do make a small commission but I would not promote this product if I didn’t own and use this book ALL the time. Tess has laid out all the information in such a great visual way that I know you will learn lots! So thank you for letting me baking nerd out on you today. Here is the list of essential cookie making tools that I love and use. These are affiliate links, and I do receive a small commission but that little bit extra that I receive costs you nothing and helps to grow this blog so thank you in advance! Until next time, happy baking (cookies) everyone! Love these tips!! So helpful!